Apparently, each United States president does a little extreme makeover of their office. Today, President Obama's oval office makeover was revealed. Although I do enjoy a little traditional style (I do live in a colonial style house built in 1900 after all), this office is a little too traditional for me. An interesting design concept worth mentioning is surrounding yourself with what inspires you. The quotes bordering the presidential seal are prominent American statements. For example, 'The only thing we have to fear is fear itself.' - FDR inaugural speech. Whether it is a written statement, a family heirloom or an image that brings back fond memories, it is great to be in an environment that makes you happy. Of course, second only to the people that make you happy. I recently found a print that makes me smile each time I walk up the stairs. It also happens to get the Beatles song 'All you need is love' in my head quite often, but hey, that is something I can deal with. Happy Tuesday! 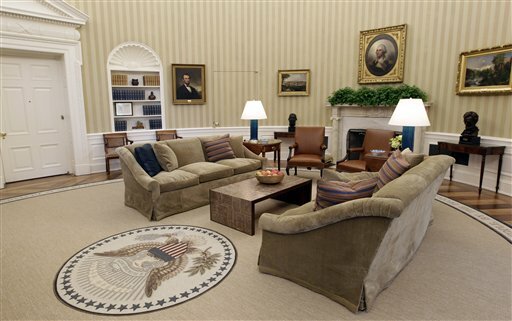 *Oval office images from the Associated Press. My fav decor are books & pictures of family/friends. But these aren't super classy decor items - so I'm always trying to make our house spiffy. Perhaps I could make something like your LOVE hanging. 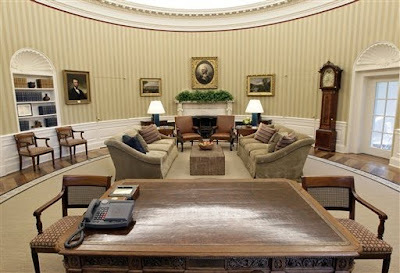 It's lovely :) And I do like the Oval Office make over. I mean, I'd freak out if it was Miami classy instead of DC classy! But I agree in that I wouldn't put that design in my house. Hey Mo! Yeah, getting a little statement print would be cool, but of course you should keep your fam/friends books and pics around! You could always update the frames or books if you want to change the look. I like the idea of getting simple frames of the same material and color so you can switch them in and out of different rooms without messing up the decor!